When it comes to jewels, bigger is definitely better. 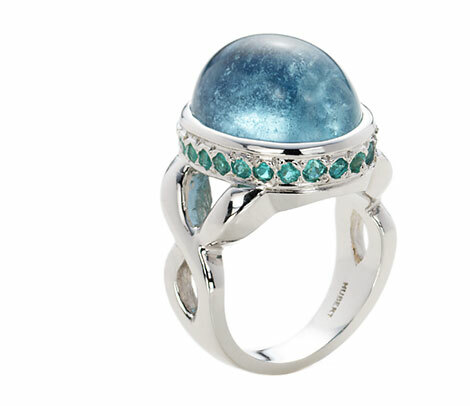 The big, bold gemstone ring is the star of the season. Stylish women are wearing these attention-getting rings with everything, even jeans and tank tops. Most new designs supersize the gem and keep the setting simple. Clean lines make the look modern and fun, despite the diva-worthy glamour of the jumbo gems. Look for large domed cabochon cut, emerald cut, and oval shapes. Bold but affordable styles often feature amethyst, citrine, blue topaz, rose quartz, rutilated quartz, turquoise, or coral, set in either silver or gold. For maximum impact, try gems in vivid, saturated jewel tones like tourmaline, tanzanite, and garnet. Of course, if you are a rock star, nothing but a jawbreaker-sized emerald, sapphire, or South Sea cultured pearl will do. Just don't expect to slink past the paparazzi with your dark glasses on: with a ring this dramatic, you are bound to be noticed.